With a venerable history as a healing art, it's no surprise that scientists are now finding measurable positive immune system changes following one-hour drumming sessions. 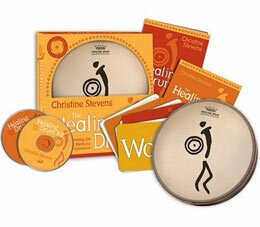 With The Healing Drum Kit, internationally acclaimed music therapist Christine Stevens shows you how to use the art of drumming to ignite your creativity, release tension and anxiety, exercise the body, and communicate with a power beyond words. - 2 CDs of music for solo play or "drum circle jams"
Whether relaxing to the gentle lub-dub of a heartbeat, exploring sacred rhythms from around the globe, or simply drumming away stress, people of all ages will experience and enjoy the full spectrum of this ancient art, with The Healing Drum Kit. "Christine Stevens has put together a terrific kit that can introduce you to the magic, fun, and healing power of drumming. I recommend it." - Andrew Weil, M.D. Christine Stevens, director of Music Therapy and Wellness Programs at Remo Drum Company and through her own company UpBeat Drum Circles, has led music and wellness seminars internationally in places including Japan, Hong Kong, Korea, Taiwan, England, and the USA. For more about Christine, visit her web site at www.ubdrumcircles.com.